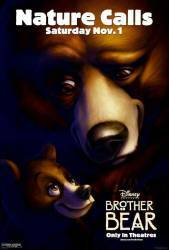 Trivia: The cliff where Kenai is transformed into a bear is shaped like a bear's head. Trivia: When Kenai says "I don't care that you and Binky found the world's biggest pine cone ever" and Koda replies "First of all, it's not Binky, it's Bucky, and it wasn't a pine cone it was a pine nut" they are not saying the scripted lines. Joaquin Phoenix was supposed to say "Bucky" and "pine nut" but he got it wrong and Jeremy Suarez corrected him. Singer: Great Spirits of all who lived before/ Take our hands and lead us/ Fill our hearts and souls with all you know/ Show us that in your eyes/ we are all the same/ Brothers to each other/ In this world we remain/ truly brothers all the same. Tanana: You left too soon, Sitka. Your brothers need your guidance. Question: At the salmon run, what does the foreign bear say? Chosen answer: A good translation would be "I almost froze to death while I was going over the huge icy mountain pass, it was something which I only barely survived! Barely! Question: Why did Sidka sacrifice himself to kill the bear, instead of running and stabbing the bear with his spear? By doing so he only made Kenai try to get revenge on the bear. Answer: The bear injures Sitka right before he sacrifices himself. We don't see the injury itself due to the film wanting to keep its G rating, but we do see the bear attack and most likely maul Sitka, heavily implying his injuries are fatal. This is why he's hunched over and breathing heavily when we next see him as the bear is moving towards Kenai and Denahi. Answer: Sitka may not have wanted to harm the bear at all. He doesn't seem to be that kind of a person he sacrificed himself so that the bear could live.